Thu., Jan. 22, 2009, 5:11 p.m. Heavy freezing fog over the past 10 days was caused by an unusually stable high-pressure system that pushed air downward against a low-elevation layer of moisture-laden air, which condensed into fog. 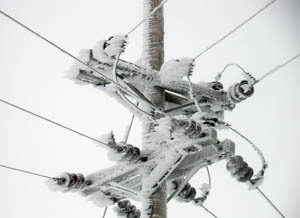 An accompanying lack of wind allowed its super-cold water droplets to form as hoar frost, which accumulated on power lines. Although feathery in appearance and brittle to the touch, the ice was heavy enough to bring down lines, limbs and trees. Meteorologists in Spokane said the high pressure overhead was the strongest ever recorded from November through April since such measurements began in 1948. A change expected by Saturday should end the ice problem. DAVENPORT – Oldtimers in northern Lincoln County west of Spokane say they’ve never seen anything like it. A dense layer of persistent fog has caused ice to accumulate relentlessly, weighing down power lines and poles and touching off widespread power outages over a broad arc of the county from Almira to Reardan. The “storm” of freezing fog began Jan. 13 under a strong high-pressure system that moved from California across the Inland Northwest, ending the region’s three-week bout of record-breaking snow. While other people were digging out, Lincoln County was going dark. “We’ve lived with fog all our lives, but I’ve never seen it build up like this on lines, trees, houses, cars, everything,” said Linda Spencer, a longtime resident of Davenport, a city that by Thursday had been covered in an eerie kind of white with layers of broken tree limbs in yards. “I know there are people around here who have been out (of power) for five and six days,” Spencer said. Some are comparing it to Spokane’s legendary ice storm of 1996 that cut power for a week or more to many residents. When the Lincoln County outages became widespread late last week, Avista Utilities and Inland Power and Light Co., which both serve the area, called in crews from outlying areas. Avista also brought in private contractors. The ice buildup became so bad that some workers were being dispatched to knock down ice from the most vulnerable lines before it could cause another outage. “We’ll work 16-18 hours and go rest for six,” said Jim Sanchez, a foreman for a crew of linemen who were using telescoping fiberglass poles to knock ice from the Devil’s Gap-Lind transmission line on Thursday. Several thousand customers at a time have been without power. As soon as crews could get the number of outages down, another round of outages would occur. Inland Power had about 100 workers deployed Thursday. Avista had about 85 line workers. Both utilities were using a variety of equipment, including snow cats, front loaders, plows and snowmobiles. They have fought low visibility, ice, snow and fatigue. “You couldn’t see 100 feet in front of you,” said Steve Aubuchon, Avista’s operations manager in the Davenport area. The only injury among the Avista workers was a single strained thumb. As of Wednesday night, Avista had replaced 160 power poles, 1,400 insulators and more than 60 transformers. Along the Devil’s Gap-Lind transmission line last week, ice initially took out six high-rise poles. The number soon increased to 11 poles and then 27 before the damage stopped. The nearby Devil’s Gap-Stratford transmission line broke Wednesday night, temporarily cutting power to Davenport, Harrington and Odessa, Aubuchon said. Lincoln County had no more than 200 customers without power late Thursday, although Inland Power said the problem had spread to the West Plains and Whitman County. Power outages affecting more than 1,000 customers were also reported by Kootenai Electric Cooperative in and around Plummer, Worley, Bayview, Garwood and the west side of Lake Coeur d’Alene. One crew for Inland was stationed at its Rocklyn substation about five miles west of Davenport knocking ice off the equipment each day, said Catherine Markson, spokeswoman for Inland. Nearly all of the Avista workers, including Aubuchon, hadn’t seen their families in more than a week. Aubuchon said he was sleeping a few hours each night on a cot in the Avista office in Davenport. Published: Jan. 22, 2009, 5:11 p.m.